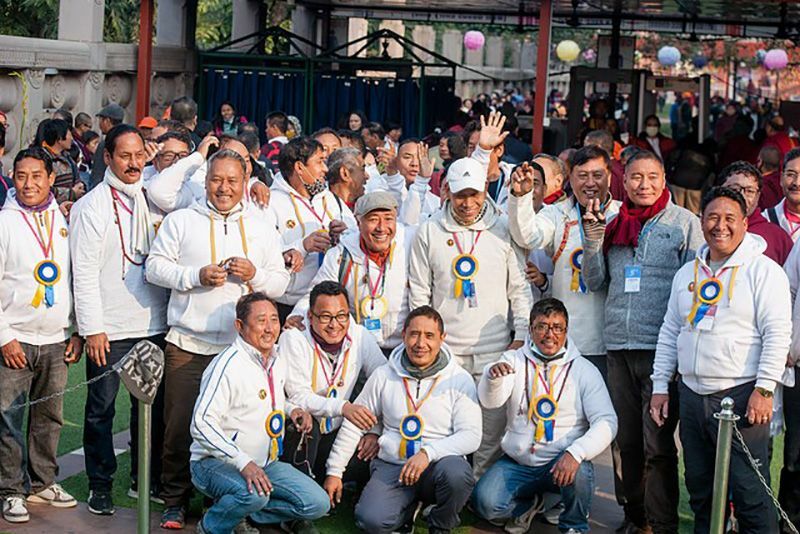 Goshir Gyaltsap Rinpoche began the first day of the 36th Kagyu Monlam by giving the participants the twenty-four hour sojong vows. Having concluded the early morning chanting and a tea break, Gyaltsap Rinpoche directed our attention to cultivating bodhichitta, the mind of awakening. 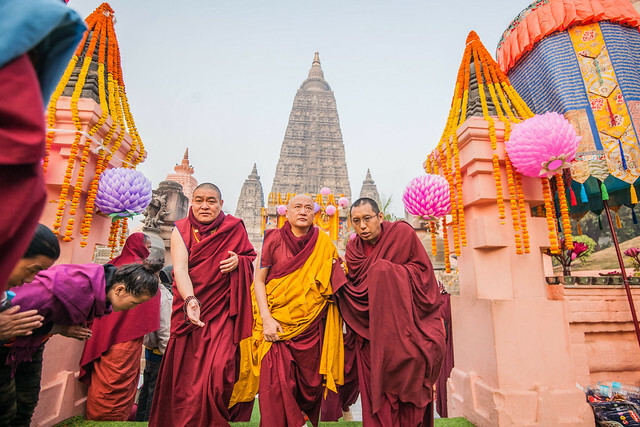 He reminded everyone that if you practice the Mahayana path and take vows, whether as a young novice monastic or as a lay person, they should be taken and received with a mind moistened with bodhicitta. He emphasized, if we are to practice the teachings of the secret Mahayana, every empowerment should also be received with the mind of awakening. 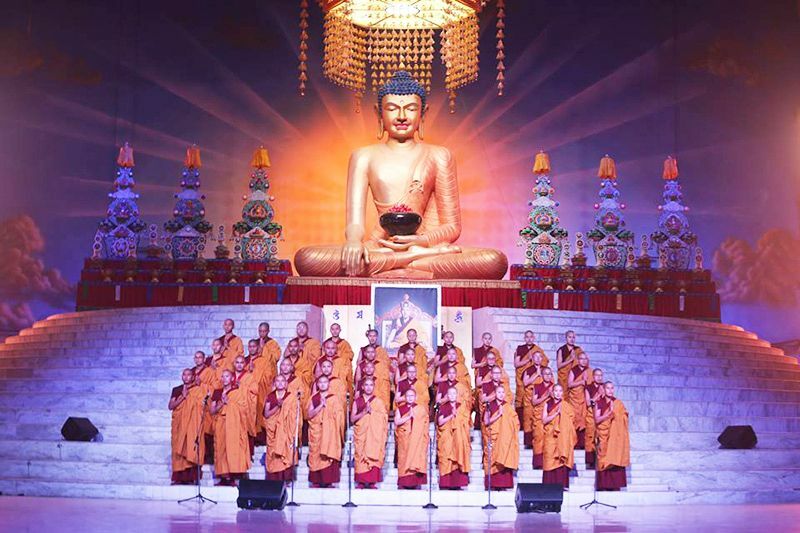 As he noted, the Buddha dispensed the teachings of the Mahayana based on the capacity of the student. These days, however, it is difficult to find a lama who can distinguish which disciples have the right capacity. Therefore, the teachings are given on the basis that the student wishes to develop a strong capacity to receive the teachings. For any practice these days, interest must be vast and longing must be strong. Only then will we come to possess and embody the practice. Even if we give rise to the mind of awakening, we need it to increase. We cannot simply give rise to the mind of awakening and leave it at that. In order to increase the mind of awakening further and further, we should always consider the benefit of others and never regard our own benefit as important. For instance, he continued, if we are practicing and we receive fame or wealth, it should only be received so that it can of benefit to all sentient beings. Otherwise, if fame or wealth will not benefit others, we should not ask for it. Another example is that we may have aspirations to experience the sufferings of hell if it will be beneficial to other sentient beings. Furthermore, when we are practicing the Dharma, our aspiration should be for the result of realizing the path of seeing in order to benefit sentient beings. If this benefit is not there, then there is no benefit in striving for this. Similarly, the timing of when the Buddha Maitreya attains the state of Buddhahood is in accord with when it will be most beneficial to sentient beings. So now, even though we may have given rise to the mind of awakening, we do not have fortitude. For countless births in the past, we have only thought of our own benefit and engaged in misdeeds for a hundred-thousand or more lives, since we have a strong habituation for self-cherishing. It is like Shantideva said, even though we want happiness, we view the causes of happiness as an enemy. When striving for happiness, we engage in things that are actually misdeeds and we end up experiencing suffering. We want happiness but we are engaging in the wrong means. Subsequently, when experiencing this suffering, we do even more things for our own benefit which we mistakenly believe will lead happiness. Then again, these turn out to be misdeeds. We engage in negative actions and then experience more suffering. Suffering just increases and increases. This is because we are not seeing things clearly. We are obscured by ignorance. We engage in the wrong paths and the wrong means to accomplish our wishes for our own benefit. 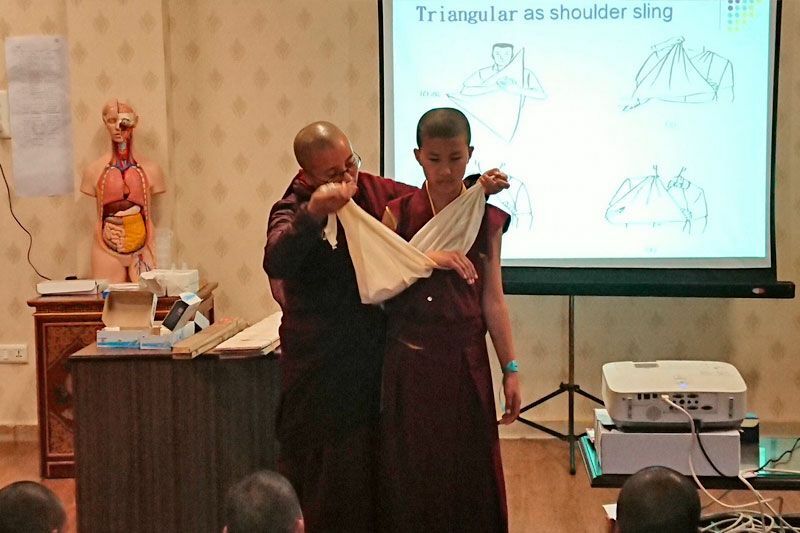 Rinpoche gave several examples. We think we want some delicious food and end up killing an animal, which results in a negative birth in a hell realm in the future. Other times, we encounter things we wish to avoid and fall sway to aversion and jealousy creating further causes for suffering. So to abandon this way of thinking we must give rise to compassion and loving kindness. The Buddha gave these teachings to Maitreya who taught them to Atisha. 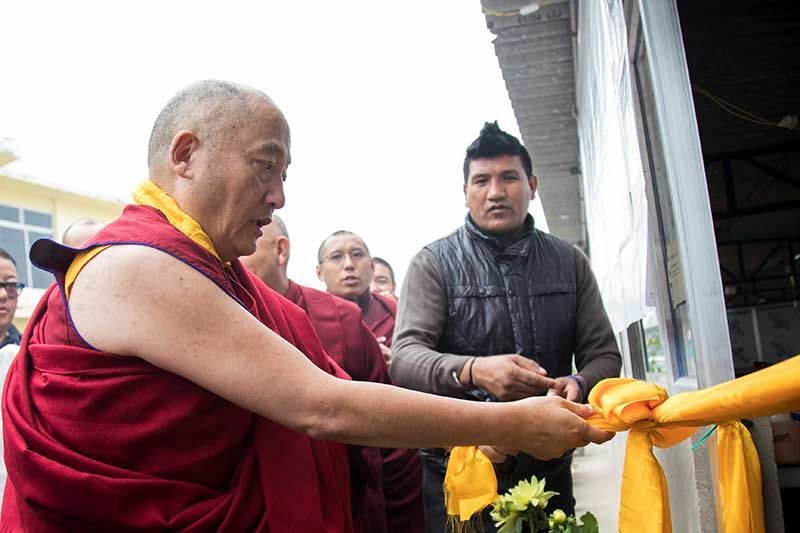 Rinpoche continued, due to Atisha’s kindness of spreading these teachings throughout Tibet, and since we are so fortunate to receive these teachings, we need to put them into practice. 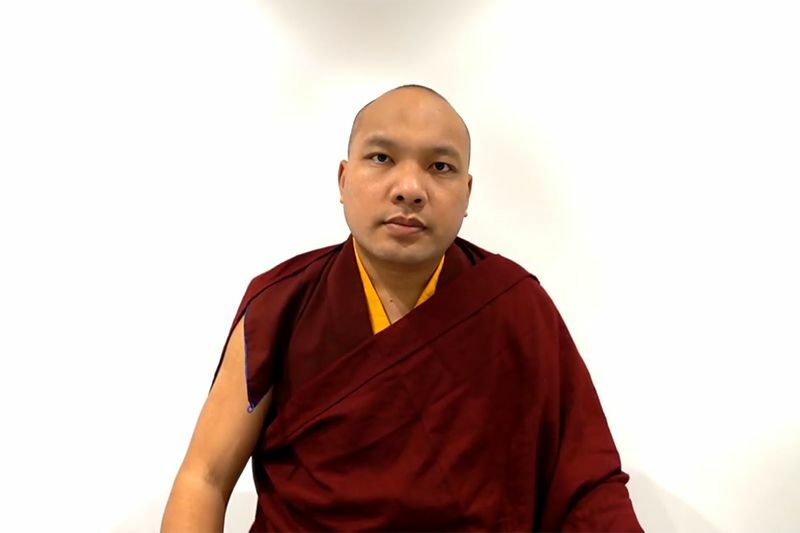 Following this profound instruction on bodhicitta, as requested by His Holiness Gyalwang Karmapa, Gyaltsap Rinpoche began teaching the mind training text – Geshe Chekawa Yeshe Dorje’s The Seven Points of Mind Training: Oral Advice of the Mahayana. These teachings were passed through Jowo Atisha to Lord Gampopa. During this session, Rinpoche focused on the first point, the preliminaries, and on one aspect of the second point, actual practice. Regarding the preliminaries, we must give rise to the fruit of practice for it to take root in our being. And for this to happen, we have to receive the blessings of the lama. Rinpoche noted that long ago, when the Buddha turned the first wheel of Dharma and gave teachings to his five great disciples, on hearing the teachings which were imbued with the Buddha’s blessing and compassion, they simultaneously attained the state of arhat. So, for that very reason, when we are beginning our session, we begin our meditation seated in lotus posture, visualizing our guru on a lotus on a moon disk above our head. We supplicate our guru who rests in non-referential compassion and who is none other than the Buddha Shakyamuni and Maitreya gathered into one. We supplicate the guru with prayer and then in this way, we imagine a glow of light in our heart center and the guru descends from the crown of head into our center. We beseech the guru to give us blessings so that our mind becomes mixed with the mind of the guru. Once we complete these stages of supplication, we do preliminary meditation on precious human rebirth, death and impermanence. Then we contemplate that there is not one sentient being who has not been our mother, son, or daughter in the past. This has been the case over countless births: these beings have been our parents and this should inform every experience. When we see birds, insects, and so forth, we should remember that each and every sentient being has been incredibly kind to us. Likewise, he continued, the same is true for our own children. We work really hard to give them the best of everything and we have great hopes for them. We hope that they will get a good education and great work. Whether it is our sons and daughters we have from previous lives or this life, it is clear that when we consider our countless sons and daughters in a very deep way, it helps give rise to the mind of bodhicitta. Rinpoche then turned our attention to the actual practice. For these particular teachings, we should meditate on ultimate bodhicitta and relative bodhicitta. When engaging in the practice of ultimate bodhicitta, we should find a proper seat and follow our own breath twenty-one times without making a mistake. If we make a mistake, it is a sign that our discursive thinking is out of control. If we can follow our own breath twenty-one times, then it is a sign that we are ready for meditation. We must let our mind rest as a preliminary practice. He asked, “How are phenomena like this? Is this inner mind truly existent?” He replied, “This inner mind is also not truly existent. When we look to see where this mind came from and where it stays or where it goes, we cannot find that place and that is because the mind is not truly existent.” Then, we look at outer phenomena and see it also like a dream. This is one antidote to grasping. So we must rest in the very nature of mind and if you are unsure how to do this, then you try to do your best at it, Rinpoche encouraged. He then concluded the session with a meditation for supplicating the guru.